Ever heard of Colmesneil, Texas? 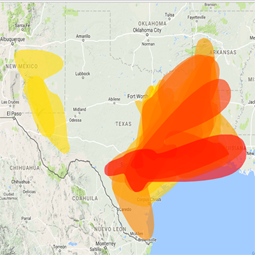 I sure haven’t until I heard the WD5TYL repeater come booming in my radio when it identified. I didn’t understand the repeater when it identified, and I tried searching for the call on QRZ.com, but I mis-heard the call sign as WE5TYL. I hit the Repeaterbook website and searched Louisiana, Arkansas, Oklahoma, and finally found it listed in the Texas list. The Tyler County Amateur Radio Association repeater is coordinated for the same frequency pair and tone as the Atlanta Rabbits Amateur Radio Club repeater. Just for grins, I shut down the Rabbit Repeater and cranked the power up on my Yaesu FT-2800 to full power (65 watts) and keyed it up just to see if I could bring up that repeater I was hearing so well. I threw my call sign out, and got a response! Floyd N. Petri, Jr. KF5YDH answered my call, and said I sounded so good that he thought I was going into the repeater locally. It was then I had to look up Colmesneil on the map. Colmesneil is about 35 miles south by southeast of Lufkin. Floyd is located in Chester, Texas, and he invited me to try hitting a repeater he is running at his location. He was apprehensive I would make it because Chester sits “in like a meteor crater,” as he described it. His antenna is only about seventy five feet in the air. I tuned my radio to 145.250 (-) 123.0pl as he instructed, and we started a nice conversation. Shortly afterwards, we were joined by Raymond Moyers N5LAX who was located in New Caney, Texas. I was chatting with a station 215 miles away on a repeater that was 155 miles away. We wrapped up the conversation after chatting for almost an hour, and I began spinning the dial. I was listening to conversations as far south as Galveston, Texas... and they were all talking about this crazy band opening. I stopped on 147.020 (+) 136.5pl repeater located in Conroe, Texas. I found Raymond N5LAX there, as well as Ramey Smith KF5GXZ in Houston, Dane Kraus KD5EWF in Huffman, Texas, and Greg Pritchett KG5NMD in Kountze, Texas. My Texas geography lesson for the day was learning where Tyler County is located. I have never heard of Colmesneil before tonight, nor have I ever heard of Doucette. Thanks to a guy in Chester, Texas, I also learned how to pronounce both of those communities, because it sure isn’t how they’re spelled. Chatting over long distances using single side band (SSB) on HF is fun, but having a 240-mile QSO on FM VHF is thrilling! The contacts have been logged, and five QSL cards were sent to commemorate this rare event.